Sharon is 28 and currently lives and works in Roscommon. 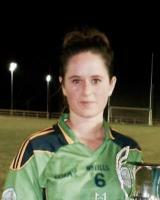 She started playing football at the age of 22 and plays with Castlerea St. Kevinâ€™s. Among the honours Sharon has achieved are Junior and Intermediate County Titles with Castlerea St. Kevinâ€™s in 2008 and 2009, Div 2 County Title in 2010, Div 3 National League Title in 2009 and Div 3 National League Runners up in 2011 with Roscommon. When she captained her club to three county titles was a proud moment for Sharon. Her most disappointing moment to date was losing the Div 3 National League Final in 2011. Her favourite sports stars are Katie Taylor and Sonia Oâ€™Sullivan. Sharonâ€™s parents are a huge influence on her football career. They offer to look after her little boy Ryan who is 6 so she can make all the trainings and matches and only for them this wouldnâ€™t be possible.